Tambour Security Door - Business & Mfg. Our tambour system features a locking door that covers your shelving securely when not in use. 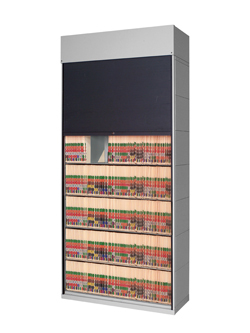 Our tambour door is designed to retrofit onto new or existing open shelf storage units to ensure the security of important documents and other types of sensitive media. Easily mounted onto most shelving units, our tambour system includes a spring tensioned door which rides along a track, recessing into a top mounted housing, allowing quick access to records/media. All of our tambour doors include a conveniently located built-in handle for easy opening/closing. Our security doors can be installed onto most existing shelving up to 88" high, making it an ideal for most shelving systems. Contact the experts at Franklin Mills to discuss tambour door security systems for your facility at 1-888-678-4585.